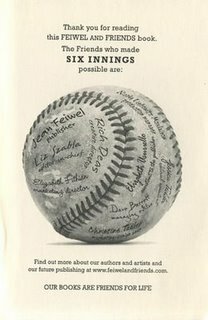 In 2008, Feiwel & Friends published my first hardcover novel, Six Innings, a book that was eventually named An ALA Notable. The cover was fabulous, featuring the work of gifted illustrator Chris Sheban, whose style you might recognize from the covers of Because of Winn-Dixie, Brooklyn Bridge, Punished, The Tiger Rising, and more. Six Innings sold reasonably okay, earned some kind reviews (and a Judy Blume comparison! ), and nobody got rich; we were happy. When it was time for the book to go to paper, my publisher had to make a decision. 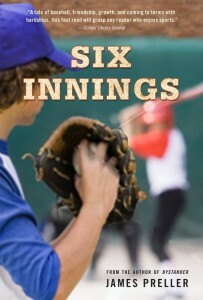 Come up with a new cover, or simply reproduce the existing cover in a paperback format, which is what they did. And the paperback edition did not sell. Understatement. It struck out, looking. This could be for a variety reasons, but one line of thought was that we were dealing with two different markets. The hardcover, with awards and good reviews, sold well in the institutional market. Paperback was a different animal, targeted more directly to the reader. I want to say the less sophisticated consumer, but that’s not right. Children these days are plenty sophisticated, it’s just that their tastes are their own. To them, these days, the photographic approach seems to hold more immediacy. At least that’s the current thinking. 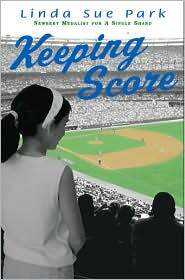 While I’ve got you (as my dad used to say), Linda Sue Park’s Keeping Score was another baseball-themed book that came out at the same time. And I confess: I hated the cover. That poor book, I thought. It just struck me, a former 10-year-old boy, as all kinds of wrong. Someone must have agreed. Take a gander at the paperback. Quite a difference, huh? It doesn’t look remotely like the same book. Curiously, in this case, the publisher went from a photographic to an illustrative approach, but more significantly re-thought the cover content and updated the design. A successful change, I think, though a dog and a fire hydrant makes me think of only one thing. Was that the idea? Dog pee? 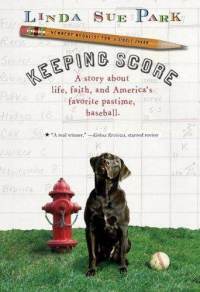 Maybe dog pee figures into the book somehow (I have not read it). The ex-boy in me wouldn’t have picked up that cover, either. 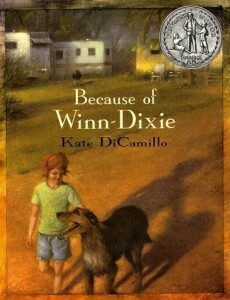 It’s also possible that the book was rewritten, with the girl character replaced by a black lab. In the end, covers are a tricky business. The author’s job is what’s inside. The official list is out — and I’m still on it! There are a lot of people to thank, and many of them signed this ball. Jean, Liz, Rich, Elizabeth F., Dave, Christine, Elizabeth U., Nicole, and Jessica: Thanks. Jean Feiwel came along and believed in me at a time when I needed exactly, precisely that. A cliche, but absolutely a dream come true: “Here’s a contract, now go write the best book you can.” Forever in her debt for that opportunity.